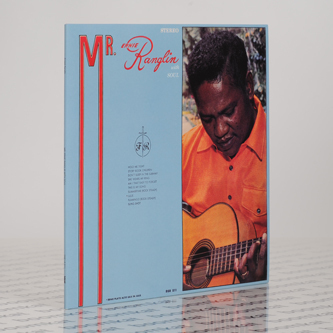 *Japanese pressing of this super-rare Rocksteady album by the Jamaican guitar virtuoso, Ernest Ranglin* "Unlike all the other musicians of his era, Ranglin was not allowed to go between studios to record and release music as he wished because he was an exclusive employee of the Federal records. Thus it's really hard to find a Rocksteady record with his name on it. Although whenever he found a spare time, he would go to Duke Reid's studio and play the guitar and bass as a sideman, often playing sessions with Lynn Taitt. According to Ranglin himself, "I felt really comfortable being at Duke Reid's studio", though sadly there have not been a single release of his solo guitar tune which was recorded there. So here comes the album, it's the rare Rocksteady instrumentals by the man himself. Some of the main features would be "Summertime", "Flamingo" and "Hold Me Tight", the wickedest selection of the moist Rocksteady that will certainly catch your heart. Other than that, there are the uptempo "Sling Shot", the relatively arranged towards pop direction "Don't Sleep In the Subway" and some ballads to represent the Federal's widely ranged style that won't go off after a long time, exactly how this one of the biggest leading labels in Jamaica had thought of. This may not make Rude Boys in downtown growl, although it will clearly last eternally as Ranglin's 60s best album to the future generations."